Just say the word and you will think of Rome. 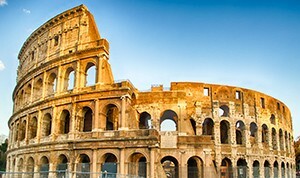 The Colosseum is the symbol of Rome, its true unique landmark. It opened in 80 A.C.. The calendar of events went on until about 500 A.C. when the last events took place. The events were scheduled as so: fights between animals or between animals and gladiators in the morning; death sentences at lunch time; gladiators fights in the afternoon. Nowadays the Colosseum is invaded by tourists. All around it you can spot the fake gladiators who make their living with the tips they get from the occasional pictures with the amused tourists. Skip the line: Everybody wants to get in so arm yourself with patience as the usual average line can last from 45 minutes to one hour. Join a guided tour or rent an audioguide because for those tours follow a different queue. You can join in as a single person as well as a group of people. Finally – since the ticket includes two more sites – you can get in from the Palatino (Via San Gregorio, 30 – 250 metres away from the Colosseum) where the queue is shorter and you can also enjoy a fantastic view. Or you can access it from the Forum (Largo della Salara Vecchia 5/6, a little further away). In any case, the Colosseum cannot host more than 3000 people at one time so if it’s a busy day all you can do is be patient. Visit the underground and the third level. 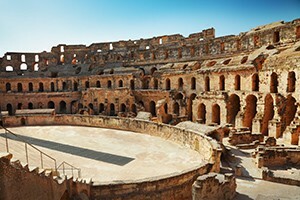 You can log on to www.coopculture.it and book a visit to the underground and to the third level of the Colosseum. From there you can enjoy a great view of the arena and the valley of the Colosseum. Discount for children and youth. Visitors under 18 years of age have free entry to the Colosseum. Visitors between 18 and 25 can get a discount. So don’t leave your ID at the hotel! The “too short” visit. You won’t find detailed information about the Colosseum on site. So, unless you had something planned in advance, you may end up spending nearly not enough time in there. And you’re going to walk back home with just a couple of random pictures and a vague memory of some old ruins. So – in order not to miss out on a great experience such as the Colosseum – you better rent an audioguide or join a guided tour. The gladiators’ “attack”. While you’re walking your way around the Colosseum chances are you are going to be harassed by funny men dressed up as gladiators who will want you to take a pictures with them. Just know that the picture’s not for free. They’ll ask at least 10 Euros for it. And by the way, they’re not authorized so you won’t get a receipt. Don’t carve your name on the walls. Just do not do it! We’re talking about of one the great wonders of the world and you want to ruin it with such a selfish act? And on top of it, it is illegal. Damaging artistic sites as well as historical sites is punished by italian laws with up to a year in jail and a fine that can range from 1000 to 3000 Euros. Hungry? Avoid the kiosks outside and go to the Pannella shop, in Via dei Fienili 61. During the summer, bring with you a hat because the sun is hot. And don’t forget a bottle of water. The Colosseum opens at 8:30 a.m. all year long. Closing time may vary from 4:30 pm to 7:15 depending on the time of the year. Check out the Coopculture website for all info about opening and closing time. Closing times: The Colosseum is open all year long. It’s never closed. Tickets: The ticket costs 12 Euros for adults. 7,50 Euros for youth between 18 and 25 years of age and for all teachers that belong to the European Community. Ticket is free for children, youth under 18 and for everyone on every first Sunday of each month. The ticket is valid for 2 days and gives you access to the Palatino and the Forum as well. You need to show your ID in order to get the discounts. Guided tours and audioguides: The regular guided tours (generally 45 minutes long ) cost 5 extra Euros. To get a guided tour to the undergrounds (generally 1 hour and 15 minutes long), you pay 9 extra Euros. The audioguide (1 hours and 10 minute long) costs 5 Euros. Booking: You can book your ticket and the tours either by calling this number: +39.06.39967700 or by logging on the Coopculture website. There’s a 2 Euro charge for booking rights. Purchase Points: You can purchase and collect your tickets at the ticket offices of the Colosseum right there on the spot, of the Palatino (Via di San Gregorio 30 or Piazza Santa Maria Nova 53) and of the Forum (Largo della Salara Vecchia 5/6). Subway: This is the fastest way to get to the Colosseum. Take the B line and get off at Colosseum station. Get out of the station and it stands right in front of your eyes. Bus and streetcar: You can either take the buses n. 75, 81, 673, 175 and 2014 or the streetcar n. 3. Maps: Every day, from 9 am to 7 pm, you can go to the Pit (Tourist Information Point) in via dei Fori Imperiali and you can collect maps of various sizes of the Fori Imperiali (The Forum).